Old Chang Kee, Chicken Porridge. When it comes to the old label, Old Chang Kee, many of us surely tried all their fried food especially their curry puff. I like their curry puff too, occasionally we will order it for party or any other occasions. Also, I love the Old Change Kee, chicken porridge with the yau tiao. It is a breakfast set and always sold-out early. The porridge is well tasted but I feel it would be better if they can adjust the amount of the white pepper in the porridge or put it as an option for people to add it if they want to at the counter. The hot porridge mixes well with sesame oils and white pepper and eat it with the yau tiao, a Chinese fried dough, as you can see the long fried stick on top of my porridge. Dip the yau tiao into the porridge and it will become soften, easy and delicious when you bite it. 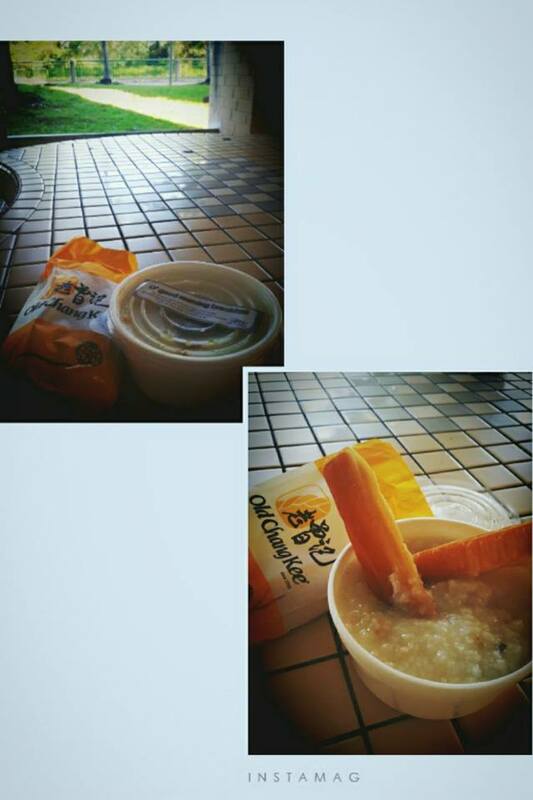 It is a filling porridge or breakfast meal which it worthy to buy for breakfast and you can have late lunch.